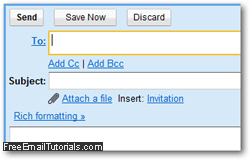 As you learned in a previous tutorial, you can add a signature emails sent from Gmail; in most cases, you will want to send all messages including your email signature, but if you occasionally want to remove it from an email, all you have to do is manually select the text of your signature and delete it, as you would with normal text in the message body (hit the Del key on your keyboard when the signature text is selected, or right-click and choose "Delete"). But if you find yourself regularly deleting the email signature text, the better solution is to temporarily disable the automatic sign in for your Gmail account - this setting also leaves you the option of turning your signature back on later, without having to type it all from scratch, as you'll learn in this tutorial. Follow these simple steps to prevent Gmail from automatically adding your signature to emails you compose from your web browser (in other words, this will not affect an email program from which you use Gmail, for example). Your Gmail account's "General" settings should be automatically selected - if not, click on that tab at the top. Towards the second half of your general settings, you'll find the "Signature" options: the blank radio button should be selected, instructing Gmail to automatically add the signature listed below that to all outgoing email messages. Once you are done, scroll down to the bottom of the page and click "Save Changes" to apply the email signature turned off setting.